From: Pattison, D.R.M. and Harte, B. Ballachulish Igneous Complex and aureole: a field guide. Edinburgh : Edinburgh Geological Society, 2001. Excursion for Day 5 - Medium- to high-grade pelitic and talc -silicate hornfelses, marbles; migmatites, including`chocolate-tablet type; summit(s) of Beinn a' Bheithir. We acknowledge Forest Enterprise, and in particular Donald Hendry, for advice on paths and roads through the Glen Duror Forest and for much logistical assistance. Stefan Weiss suggested the Day 2 traverse and provided abundant additional advice and factual information, in addition to compiling and hand-drafting the original map that became the basis for the Coloured Map in the back pocket. Gerard White showed much skill and wizardry in handling computer graphics to compile the Coloured Map and prepare the other maps in this guide. 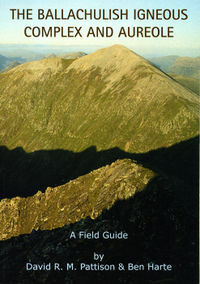 The Edinburgh Geological Society and Moray Endowment Fund (University of Edinburgh) provided grants in support of the publication of this guide book. Anderton, R. 1985. Sedimentation and tectonics in the Scottish Dalradian. Scottish Journal of Geology, 21, p.407-436. Atherton, M.P. 1977. The metamorphism of the Dalradian rocks of Scotland. Scottish Journal of Geology, 13, p.,331-370. Bailey, E.B. 1910. Recumbent folds in the schists of the Scottish Highlands. Quarterly Journal of the Geological Society of London. 66. p. 586-620. Bailey, E.B. 1923. The metamorphism of the southwestern Highlands of Scotland. Geological Magazine, 60, p.317-370. Bailey, E.B. and Maufe, H.B. 1916 (first edition); 1960 (second edition). The geology of Ben Nevis and Glen Coe and the surrounding country: Explanation of Sheet 53. Memoirs of the Geological Survey of Scotland. Published by the British Geological Survey (Edinburgh). Barrow, G. 1893. On an intrusion of muscovite-biotite gneiss in the south­eastern Highlands of Scotland and it accompanying metamorphism. Quarterly Journal of the Geological Society of London, 49, p.330-358. Bowes, D.R. and Wright. A.E. 1967. The explosion-breccia pipes near Kentallen, Scotland, and their geological setting. Transactions of the Royal Society of Edinburgh, 67, p. 109-141. Buntebarth, G. 1991. Thermal models of cooling. In: Equilibrium and Kinetics in Contact Metamorphism: The Ballachulish Igneous Complex and its Aureole. Edited by Voll, G., Topel, J., Pattison, D.R.M. and Seifert, F.; published by Springer Verlag. (Heidelberg): p. 379-404. Buntebarth. G. and Voll, G. 1991. Quartz grain coarsening by collective crystallization in contact quartzites. In: Equilibrium and Kinetics in Contact Metamorphism: The Ballachulish Igneous Complex and its Aureole. Edited by Voll, G., Topel, J., Pattison, D.R.M. and Seifert, F.; published by Springer Verlag (Heidelberg); p. 251-266. Clough, C.T. 1897. The Geology of Cowal. Memoir of the Geological Survey of Scotland; published by British Geological Survey. Clough, C.T., Maufe, H.B. and Bailey. E.B. 1909. The cauldron subsidence of Glen Coe and the associated igneous phenomena. Quarterly Journal of the Geological Society of London, 65, p. 611- 676. Dempster, T.J. 1985. Uplift patterns and orogenic evolution in the Scottish Dalradian. Journal of the Geological Society of London, 142, p. 111‑128. Elles, G.L. and Tilley, C.E. 1930. Metamorphism in relation to structure in the Scottish Highlands. Transactions Royal Society of Edinburgh, 56. p.621-646. Ferry, J.M. 1996a. Prograde and retrograde fluid flow during contact metamorphism of siliceous carbonate rocks from the Ballachulish aureole. Scotland. Contributions to Mineralogy and Petrology, 124, p. 235-254. Ferry, J.M. 1996b. Three novel isograds in metamorphosed siliceous dolomites from the Ballachulish aureole, Scotland. American Mineralogist, 81, p. 485-494. Fraser, G.L., Paulson, D.R.M. and Heaman, L.M. 2000. Geochronological and petrological investigations in the Ballachulish area, Scotland: local exhumation rates and implications for U-Ph geochronology of metamorphic processes. GeoCanada 2000 (Geological Association of Canada – Mineralogical Association of Canada Joint Annual meeting). Abstracts with Program. Harte, B. 1988. Lower Palaeozoic metamorphism in the Moine-Dalradian belt of the British Isles. In: The Caledonian-Appalachian Orogen. Edited by Harris, A.L. and Fettes, D.J. ; published by Geological Society. London. Special Publication, 38. p. 1 23-134. Harte, B. and Voll, O. 1991. The setting of the Ballachulish intrusive igneous complex in the Scottish Highlands. In: Equilibrium and Kinetics in Contact Metamorphism: The Ballachulish Igneous Complex and its Aureole. Edited by Voll, G., Topel, J., Pattison, D.R.M. and Seifert, F.; published by Springer Verlag (Heidelberg); p. 3-17. Harte, B., Pattison, D.R.M. and Linklater, C.M. 1991a. Field relations and petrography of partially melted pelitic and semi-pelitic rocks. In: Equilibrium and Kinetics in Contact Metamorphism: The Ballachulish Igneous Complex and its Aureole. Edited by Voll, G., Pattison, D.R.M. and Seifert, F.; published by Springer Verlag (Heidelberg); p.181-210. Harte, B., Pattison, Heuss-Aßbichler, S., Hoernes, S., Masch, L. and Weiss, S. 1991b. Evidence of fluid phase behaviour and controls in the intrusive complex and its aureole. In: Equilibrium and Kinetics in Contact Metamorphism: The Ballachulish Igneous Complex and its Aureole. Edited by Voll, G., Topel, J., Pattison, D.R.M. and Seifert, F.; published by Springer Verlag (Heidelberg); p.405-422. Haslam, H.W. and Kimbell, O.S. 1981. Disseminated copper-molybdenum mineralisation near Ballachulish, Highland region. Mineral reconnaissance programme report, Institute of Geological Sciences (U.K.), 43. p.1-42. Heuss-Aßbichler, S. and Masch, L. 1991. Microtextures and reaction mechanisms of carbonate rocks: a comparison between the thermoaureoles of Ballachulish and Monzoni (N. Italy) In: Equilibrium and Kinetics in Contact Metamorphism: The Ballachulish Igneous Complex and its Aureole. Edited by Voll, G., Topel, J., Pattison, D.R.M. and Seifert, F.; published by Springer Verlag (Heidelberg); p. 229-249. Hickman, A.H. 1975. The stratigraphy of late Precambrian metasediments between Glen Roy and Lismore. Scottish Journal of Geology, 14. p.191-212). Hoernes, S., Macleod-Kinsell, S., Harmon, R.S., Paulson, D.R.M. and Strong, D.F. 1991. Stable isotope geochemistry on the intrusive Complex and its metamorphic aureole. In: Equilibrium and Kinetics in Contact Metamorphism: The Ballachulish Igneous Complex and its Aureole. Edited by Voll, G., Topel, J., Pattison, D.R.M. and Seifert, F.; published by Springer Verlag (Heidelberg); p. 351-378. Holdaway, M.J. 1971. Stability of andalusite and the aluminum silicate phase diagram. American Journal of Science, 271, p. I 75-198. Holness, M. and Clemens, I.C. (1999) Partial melting of the Appin 'Quartzite' driven by H2O infiltration in the aureole of the Ballachulish Igneous Complex. Contributions to Mineralogy and Petrology, 136, p. 154-168. Johnson, M.R.W. and Frost, R.T.C. 1977. Fault and lineament patterns in the southern highlands of Scotland. Geologie en Miinbouw, 56. p. 287-294. Kroll, Krause, C. and Voll, G. 1991. Disordering. re-ordering and unmixing in alkali feldspars from contact metamorphosed quartzites. In: Equilibrium and Kinetics in Contact Metamorphism: The Ballachulish Igneous Complex and its Aureole. Edited by Voll, G., Topel, J., Pattison, D.R.M. and Seifert, F.; published by Springer Verlag (Heidelberg); p. 267-296. Linklater, C.M., Harte. B. and Fallick, A.E. 1994. A stable isotope study of the migmatitic rocks in the Ballachulish contact aureole, Scotland. Journal of Metamorphic Geology, 12, p. 273-283. Litherland, M. 1980. The stratigraphy of the Dalradian rocks around Loch Creran, Argyll. Scottish Journal of Geology, 16. p. 105-123. Litherland, M. 1982. The structure of the Loch Creran Dalradian and a new model for the SW Highlands. Scottish Journal of Geology, 18, p.205­225. MacCulloch, J. 1817. Observations on the mountain Cruachan in Argyllshire, with some remarks on the surrounding country. Transactions of the Geological Society. 4. p. 117-138. MacKnight, T. 1821. Mineralogical notes and observations. Memoirs of the liternerian Natural History Society, 3, 104-122. Masch, L. and Heuss-Aßbichler, S. 1991. Decarbonation reactions in siliceous dolomites and impure limestone. In: Equilibrium and Kinetics in Contact Metamorphism: The Ballachulish Igneous Complex and its Aureole. Edited by Voll, G., Topel, J., Pattison, D.R.M. and Seifert, F.; published by Springer Verlag (Heidelberg);p. 211-228. Nockolds, S.R. and Mitchell, R.L. 1948. The geochemistry of some Caledonian plutonic rocks; a study in the relationship between the major and trace elements of igneous rocks and minerals. Transactions Royal Society of Edinburgh. 61 p.533-575. Pattison, D.R.M. 1985. Petrogenesis of pelitic rocks in the Ballachulish thermal aureole. University of Edinburgh Ph.D. thesis (unpublished). Pattison, D.R.M. 1989. P-T conditions and the influence of graphite on pelitic phase relations in the Ballachulish aureole. Scotland. Journal of Petmlogy, 30. p. 1219-1244. Pattison, D.R.M. 1991. Pressure-temperature-a(H2O) conditions in the thermal aureole. In: Equilibrium and Kinetics in Contact Metamorphism: The Ballachulish Igneous Complex and its Aureole. Edited by Voll, G., Topel, J., Pattison, D.R.M. and Seifert, F.; published by Springer Verlag (Heidelberg); p.327-350. Pattison, D.R.M. 1992. Stability of andalusite and sillimanite and the Al2SiO5 triple point: constraints from the Ballachulish aureole, Scotland. Journal of Geology, 100. p. 423-446. Pattison, D.R.M. and Harte, B. 1988. Evolution of structurally contrasting anatectic migmatites in the 3-kbar Ballachulish aureole, Scotland. Journal of Metamorphic Geology, 6. p. 475-494. Pattison, D.R.M. and Harte, B. 1991. Petrography and mineral chemistry of pelites. In: Equilibrium and Kinetics in Contact Metamorphism: The Ballachulish Igneous Complex and its Aureole. Edited by Voll, G., Topel, J., Pattison, D.R.M. and Seifert, F.; published by Springer Verlag (Heidelberg);135-180. Pattison, D.R.M. and Voll, G. 1991. Regional geology of the Ballachulish area. In: Equilibrium and Kinetics in Contact Metamorphism: The Ballachulish Igneous Complex and its Aureole. Edited by Voll, G., Topel, J., Pattison, D.R.M. and Seifert, F.; published by Springer Verlag (Heidelberg); p.19-38. Pattison, D.R.M. and Harte, B. 1997. The geology and evolution of the Ballachulish Igneous Complex and Aureole. Scottish Journal of Geology, 33, p.1-29. Rabbet, W. and Meissner, R. 1991. The shape of the intrusion based on geophysical data. In: Equilibrium and Kinetics in Contact Metamorphism: The Ballachulish Igneous Complex and its Aureole. Edited by Voll, G., Topel, J., Pattison, D.R.M. and Seifert, F.; published by Springer Verlag (Heidelberg); p.121-134. Richardson, S.W., Gilbert, M.C. and Bell, P.M. 1969. Experimental determination of kyanite-andalusite and andalusite-sillimanite equilibria: the aluminum silicate triple point. American Journal of Science, 267, p. 259-272. Roberts, J.L. 1976. The structure of the Dalradian rocks in the North Ballachulish district of Scotland. Journal of the Geological Society of London, 132, p.139-154. Roberts, J.L. and Treagus, J.E. 1977. The Dalradian rocks of the Loch Leven area. Scottish Journal of Geology, 13, p.165-184. Soper, N.J. 1988. Collision and strike-slip events in the British Caledonides. In: The Caledonian-Appalachian Orogen. Edited by Harris, A.L. and Fettes, D.J. ; published by Geological Society, London, Special Publications, 38, p.481-492. Soper, N.J. and Anderton, R. 1984. Did the Dalradian slides originate as extensional faults? Nature, 307, p.357-360. Stephens, W.E. 1988. Granitoid plutonism in the Caledonian orogen of Europe. In: The Caledonian-Appalachian Orogen. Edited by Harris, A.L. and Fettes, D.J. : published by Geological Society, London, Special Publications, 38, p.389-403. Stephenson, D, & Gould, D. 1995. British regional geology: the Grampian Highlands (4th edition): published by HMSO for the British Geological Survey (London). Stevenson, R.L. 1886. Kidnapped. Published by Cassell, London. Streckeisen, A. 1976. To each plutonic rock its proper name. Earth Science Reviews, 12, p. 1-33. Tanner, P.W.G. and Leslie, A.G. 1994. A pre-D2 age for the 590 Ma Ben Vuirich Granite in the Dalradian of Scotland. Journal of the Geological Societv.151. p. 209-212. Taylor, H.P and Forester, R.W. 1971. Low-18O igneous rocks from the intrusive complexes of Skye, Mull and Arnamurchan, west of Scotland. Journal of Petrology, 12, p. 465-497. Thirwall, M.F. 1988. Geochronology of the late Caledonian magmatism in northern Rritain. .lottrnal oldie Geological Society of London. 145, p.951-967. Troll, G. and Weiss, S. 1991. Structure, petrography and emplacement of plutonic rocks. In: Equilibrium and Kinetics in Contact Metamorphism: The Ballachulish Igneous Complex and its Aureole. Edited by Voll, G., Topel, J., Pattison, D.R.M. and Seifert, F.; published by Springer Verlag (Heidelberg); p. 39-66. Voll, G. 1964. Deckenhau and Fazies im Schottisches Dalradian. Geologische Rundschau, 53, p.590-612. Weiss, S. 1986. Petrogenese des Intrusivcomplexes von Ballachulish, Westschottland: Kristallisationsverlauf in einen zonierten Kaledonischen Pluton. Unpublished Ph.D. thesis. Ludwig-Maximilians-Universität, Munchen. Weiss, S. and Troll, G. 1989. The Ballachulish Igneous Complex. Scotland: Petrography, mineral chemistry and order of crystallisation in the monzodiorite-quartz diorite suite and in the granite. Journal of Petrology, 30. p. 1069- III 6. Weiss, S. and Troll. G. 1991. Thermal conditions and crystallisation sequence in the Ballachulish Complex. In: Equilibrium and Kinetics in Contact Metamorphism: The Ballachulish Igneous Complex and its Aureole. Edited by Voll, G., Topel, J., Pattison, D.R.M. and Seifert, F.; published by Springer Verlag (Heidelberg); p. 67-98. Wiseman, J.D.H. 1934. The central and south-west Highland epidiorites: a study in progressive metamorphism. Quarterly Journal of the Geological Society of London. 90, p. 354-417. This page was last modified on 5 November 2015, at 23:54.